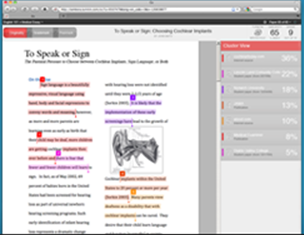 Managed by the Center for Teaching and Learning, Turnitin service checks originality of authors' work. If a Similarity Report indicates similarity to a PAPER written in another class, you will not be able to contact the instructor of that class to inquire about the paper. A call to the Turnitin helpdesk (see Support for instructions) may help. Grademark and the submission of grades is different between Turnitin's version and D2L. Inform students that papers will be submitted to Turnitin. Two places you may want to put the following paragraph: D2L Course News or Your Syllabus. Educate your students about plagiarism. Let them know your standards as well as Marquette's Academic Integrity Standards/Policies. See Learn More: Plagiarism & Academic Honesty Guide. Avoid Confusion and mistakes by clearly labeling and dating TII assignments. To enable Turnitin for a Dropbox folder, check the Enable for this Folder box. To configure additional Turnitin options for the Dropbox folder, expand the Show Advanced Similarity Report Options by Clicking on the link. Checking the box for Allow Submitters to See Similarity Reports allows students to see the Similarity Report for the documents they have submitted. Note: It takes approximately 15-60 minutes to see the result after submitting a document. The Frequency setting determines if the Similarity Report will be run on all submissions to the Dropbox, or if individual submissions will be selected manually. If Identify Individual Submissions for Similarity Report is selected, a button will appear in the Report column for each submission. When the instructor clicks that button, it will submit only that document. The Check Submissions Against options determine which sources the submitted documents will be checked against for originality. If the Index Files for the Similarity Report option is checked, the documents submitted to the Dropbox will be used by Turnitin to compare documents submitted by others to check for originality. Note: Do not check this box if you expect all student submissions to be similar for a given assignment, for drafts of a future publication, or any other material not intended to be included in the User Paper Database Turnitin used to check originality. The Similarity Report can be accessed by clicking on the color box indicator next to the percentage. Note: clicking the percentage has no effect, only clicking the box with the indicator color will open the report. 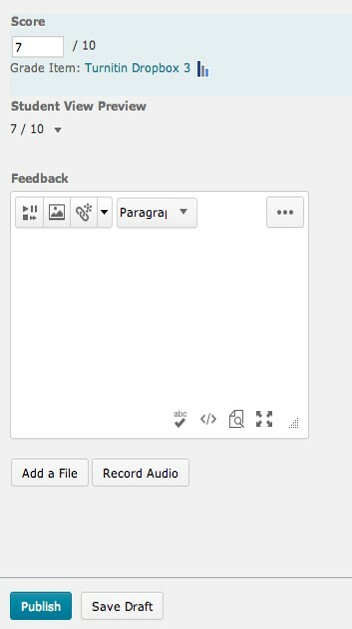 If there is a grade item associated with the dropbox, the Grademark Button will be available under the Markup Document heading (see above screen shot). 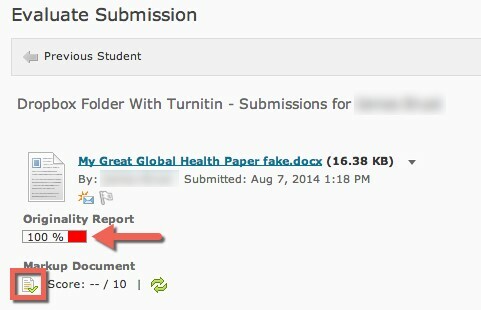 Clicking the Grademark Button will take you to the Grademark Page for the document in Turnitin. Entering a score in the upper right corner of the Grademark page will add the score to the Markup Document information in D2L. Note: the grade has not yet been applied to the evaluation or published in the D2L gradebook. Returning to the evaluation page in D2L after applying a score to a corresponding document in Grademark will display a score under Markup Document and enable the link to Use This Score. Clicking that link will add the Grademark score to the D2L evaluation. Note: it may be necessary to click the Refresh Button to the right of the score if the Grademark Score has not updated yet in D2L. Once the score is added to the evaluation, Publishing the score and feedback as usual will send that information to the associated item in in the D2L gradebook. Students are able to view the Similarity Report (provided the Allow Submitters to View Reports option is checked) and Grademark Score and Markup (provided there is a grade item associated with the dropbox and the document evaluation has been published by the instructor). Assignments that have been submitted for Originality checking will be listed with a binoculars icon. 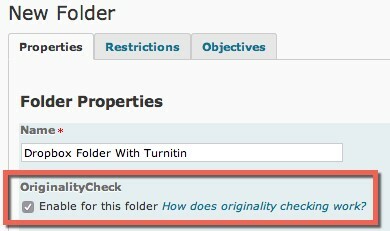 Once a Similarity Report has been processed by Turnitin, if the Student Viewing is enabled, clicking the submission number will display the documents with their associated Originality Score. Clicking the color box indicator next to the percentage will take them to the full report view. If there is an associated Grademark Score and Markup, it can ve viewed by the student by clicking the icon in the Grademark column, after the evaluation is published by the instructor.